The Union Minister for Tourism and Culture, Mr Jagmohan, today categorically declined to fund the last two phases (IV and V) of the ‘Galiara scheme’ for the beautification of the surroundings of the Golden Temple. The gilding of the interiors of the Golden Temple by the UK-based Nishkam Sevak Jatha has kicked off a controversy even as Ms Kiranjot Kaur, former General Secretary, SGPC, has sought the stoppage of the work. 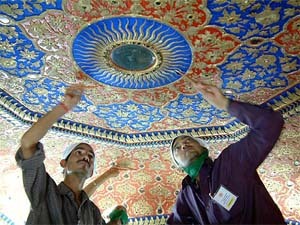 Gilding of the Golden Temple interiors in progress in Amritsar on Wednesday. People commonly attend functions in which the Chief Minister or senior state police officers are present to complain against some police atrocity. However, yesterday at the Police Academy in Phillaur, a man was seen trying to meet the Chief Minister, Capt Amarinder Singh, to plead for the cancellation of the transfer orders of the SHO of Phillaur police station. Punjab jails are chock-a-block with more undertrials than these can handle, with undertrials forming as much as 65 per cent of the total strength. This city, known as the heartland of the Malwa region in Punjab, will add another feather to its cap tomorrow when it will be accorded the status of municipal corporation by the state government and will become the fifth city of Punjab after Amritsar, Jalandhar, Ludhiana and Patiala to enjoy this status. Activists of different political parties, including the SAD, SAD (A) and the BKU (Ekta) along with residents of this and surrounding villages today staged a dharna in front of the local police station to lodge a protest against a police official, who had allegedly tortured a farmer, Mr Gurtej Singh of Banawala village a few days ago. 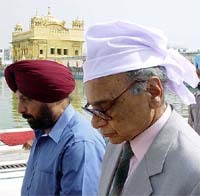 Terming the ongoing Akali unity moves as a futile exercise, the president of SAD (Amritsar) and MP, Mr Simranjit Singh Mann today said the Deputy Prime Minister, Mr Lal Krishan Advani, was trying to work out a compromise between the SAD chief, Mr Parkash Singh Badal, and the former SGPC chief Mr Gurcharan Singh Tohra. Members of the District Youth Congress in a meeting held under the presidentship of Mr Vishva Nath Banti here last evening condemned the statement of Mr Charanjit Singh Channi, Congress MP, for demanding the expulsion of Mr Kuldip Nanda, president of the District Congress Committee, Hoshiarpur, from party and levelling charges of corruption against him. The state government has earmarked Rs 102 crore for providing drinking water supply in the rural areas during the current financial year. This was revealed by Punjab Technical Education and Industrial Training Minister, Mr Mohinder Singh Kaypee, after inaugurating a Rs 24 lakh potable water supply project at Dhanal village near here yesterday. The Raja Sansi International Airport authorities here yesterday took preventive steps to counter the entry of killer pneumonia into India. A team of five doctors, nursing staff, medical attendants has been formed to prevent the deadly infection of the suspected SARS finding its way here. Former Senior Superintendent of Punjab Police Gurcharan Singh Pherurai was granted bail in a fake currency case by Mr Justice K.S. Garewal of the Punjab and Haryana High Court today. A Sikh gathering paid tributes to 13 Sikhs killed on Baisakhi in 1978 at Amritsar, at village Pheruman, 40 km from here, yesterday. The function was ogranised to mark the 304th birth anniversary of the Khalsa. Mr Ramesh Dutt Sharma, Minister of State for Removal of Grievances, today inaugurated a public hospital at Chunni, 15 km from here. Addressing a gathering on the occasion, he said private health institutions could serve the patients from weaker sections of society by providing health facilities at concessional rates. Mr Justice N.K. Sud of the Punjab and Haryana High Court today visited the sub-jail of the district and inquired about the state of the jail inmates. On the occasion he also presented a color television and a water cooler to the jail authorities which was donated by the district Red Cross for the prisoners lodge in sub jail. On a call given by the All-India Insurance Employees Association, employees of insurance companies held a demonstration here to protest against the unilateral imposition of the compulsory transfer policy for Classes III and IV employees. Contractors indulged in hooligans at a meeting organised at the Bhakra Main Line office near Tripri here today to award contracts for repair of the BML canal and other civil works. in a midnight swoop, the Vigilance Bureau arrested an assistant town planner, Bankey Bihari, in connection with a multi-storey shopping complex (Central Mall) on the Mall here. Employees of the Public Health, Building and Roads, Sewerage Board, Irrigation Departments and PUDA held a dharna yesterday in front of the PWD head office here in protest against the restructuring of the Building and Roads Department, besides other anti-employee steps being taken by the state government. Activists of the Hath-Rehri Union including roadside vendors, today observed a strike to protest against the eviction of the spots being used by them. On the pattern of the format used by banks for issuing bank drafts/fixed deposit receipts, the Department of Posts, Ministry of Communications, is planning to introduce a single printed denominationless format for the sale of National Savings Certificates and Kisan Vikas Patras in place of the printed NSCs and KVPs of different denominations in which they are presently available. Members of the Sangrur District Industrial Chamber and workers of its industrial units today started an indefinite dharna in front of the local police station, demanding the immediate arrest of Mr Balwinder Singh, president of the local Truck Union, Mr Gurpal Singh, Mr Avtar Singh and Mr Singla, all munshis of the union, and about 25 truck drivers. Dr R.K. Rampal, Director, Agriculture, said here today that schemes related to agriculture which had been shelved for the past four years were being revived to enhance compatibility of agriculture to meet global challenge in view of implementation of GATT and WTO. Mr Kulwant Singh, Joint Director, Agriculture, Punjab, said today that farmers would be provided with certified seeds of paddy, maize cotton and groundnut. Wheat has started trickling in steadily in all grain markets of the district with 3,969 metric tonnes being procured till yesterday in the whole district. The Punjab Government today shifted the Deputy Commissioner, Nawanshahr, Mr Ashok Gupta, to Jalandhar in place of Mr K. Siva Prasad, who goes on deputation as the Senior Regional Manager, FCI, Punjab. Though the Punjab Government has sent the case of its Chief Secretary, Mr Y.S. Ratra, for another three-month extension in service to the Union Government, he has no chance of getting the extension. The Chief Minister, Capt Amarinder Singh, said today that the government had forwarded Mr Ratra’s case to the Union Government. To prevent youth and those belonging to the economically weaker sections of society from falling prey to the menace of narcotics and drugs, the District Magistrate, Mr K. Siva Prasad, has ordered that no chemist in the district would sell drugs without a valid prescription. Mr Ishwar Singh, SSP, in a statement issued here today said the district police had arrested Bimla Saini, a resident of Nai Basti, Street No. 1, for allegedly running a brothel from her house under the guise of a beauty parlour. The Majitha police claims to have apprehended five members of a robbers’ gang and recovered weapons. The Board of Governors of the Sant Longowal Institute of Engineering and Technology has curtailed the financial and recruitment powers of the Director of the institute. The institute is being run by a society jointly promoted by the Punjab and Union Government.